OPEN ART: We’re dedicating this night to acrylic paint. You can paint with it, do printmaking or gelli printing, pour it, create art journal pages etc. Your choice. First, we’ll create the first print layer by using tools like stencils, stamps and string with the acrylic paint. Then we’ll create simple animal shaped masks out of paper. Then we’ll pull a second print layer that preserves the shape of the animal but lets the design of the first layer show through. 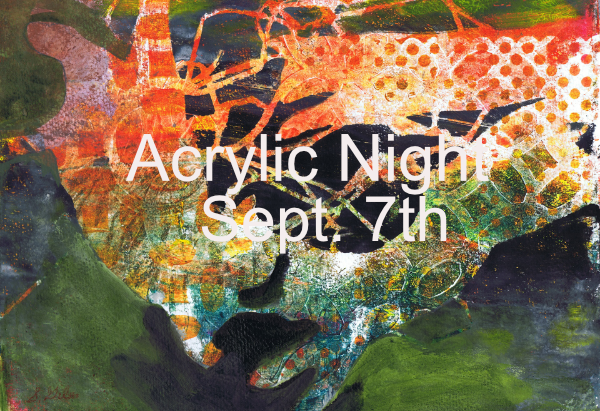 Acrylic Night repeats first Friday night of each month — with a different project each time. Our sessions are free but bring your own supplies. Sharon will bring extra gelli plates to lend but bring yours if you have one.